When Paramount announced it was making a Transformers spinoff about Bumblebee, the first reaction from a lot of people was, “…But why?” It was certainly an understandable reaction. The last few Transformers movies have been big and bombastic and it wasn’t clear how much more story there was to tell, much less about the one Transformer who doesn’t talk, at least, not in the normal sense of the word. But then the old-school designs for Bumblebee hit the internet and the trailers dropped and suddenly people were a lot more interested. Fans had hope that it would turn the franchise around and indeed, it just might. Simply put, I adored this movie. In fact, I was surprised by how much I adored it. Bumblebee is set in the ’80s as a prequel to the events of the main Transformers franchise, so if you haven’t caught the last few movies, don’t worry. While there is some connective tissue, it’s of the thinnest sort and you don’t need to have seen those films to understand this one, which is as much of a standalone story as you can get. It follows teenager Charlie (played by the delightful Hailee Steinfeld), who is having a hard time adjusting to reality after her father’s unexpected death. Her life turns around when she meets Bumblebee (voiced by Dylan O’Brien), a giant robot who doesn’t remember his past or how he came to Earth (which we see in a prologue sequence). 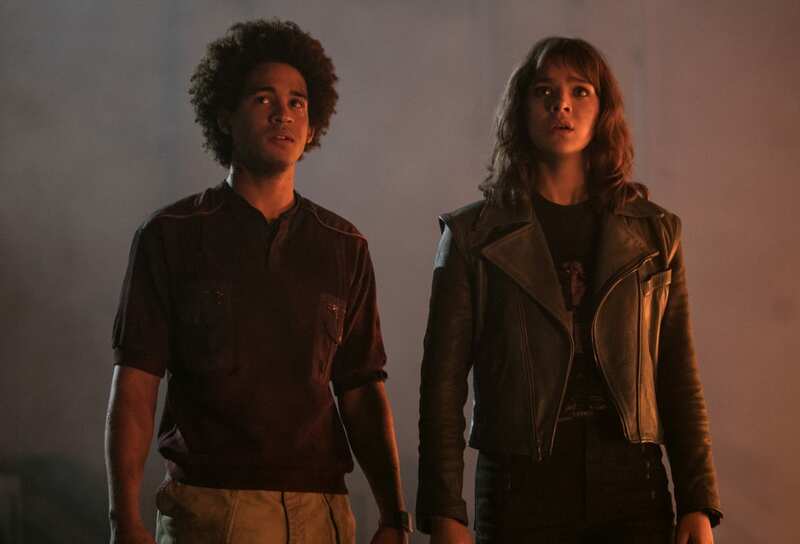 Along with Charlie’s neighbor, Memo (Jorge Lendeborg, Jr.), they piece together the mystery of where Bumblebee came from and his mission to protect the Earth. All the while they’re pursued by both Decepticons in the form of Shatter (Angela Bassett) and Dropkick (Justin Theroux) and the overzealous federal agent Burns (John Cena). The whole movie is delightful, but read on for the three big reasons you should see Bumblebee in theaters this December. The beauty of the first Transformers movie, and even the second, was that in between the big, punchy action sequences, there was plenty of time for character development and quiet moments for characters that really built the relationships between them. Unfortunately, the franchise suffered from sequel sprawl in later installments, getting bigger and noisier and KABOOM!-ier. And while we all love a good ol’ Baysian explosion-fest from time to time, a good deal of that genuineness was lost. New franchise director Travis Knight, who previously helmed the gorgeous and heartfelt Kubo and the Two Strings, tackled his first live-action film and got back to basics. That is to say, he got back to the heart of the franchise, which will essentially always be a story about a kid and their robot. Make no mistake, there are some truly eye-popping visuals and stunning fight sequences – this is still a Transformers movie, after all – but it’s the icing on the character foundation laid out by Knight and especially by screenwriter Christina Hodson rather than the foundation itself. Steinfeld’s performance as Charlie is charming – even when she’s being an angsty teen, you empathize with and root for her all the way through and there are some genuine heartstring-pulling interactions between her and her pet Transformer. When I found myself idly thinking, I wish we could give a Best Actor nomination to Bumblebee… and then reminding myself that he was, you know, a CGI robot, I knew the team had made some magic. If Charlie and Bumblebee provided the heart, then the trio of Bumblebee, Agent Burns, and Memo provided a stream of belly laughs on three different levels. The film is funny, genuinely so, and again, while much of that is down to Hodson’s writing, a ton of credit goes to Cena and Lendeborg, Jr. along with the animators. Cena’s Agent Burns is a man on a mission, the sort of hard-boiled militant government agent who is hellbent on eradicating any threat to the U.S. of A., and boy, does Cena lean into his role with relish. He’s a caricature, but he knows this and he knows that we know, and the result is moments of self-aware, deadpan humor that really work. Lendeborg brings a different kind of comedic energy as the neurotic, awkward boy-next-door with a secret crush on Charlie, and he sells it hardest when running with nerdy, bumbling pep talks to himself. His comedic timing was first on display in Spider-Man: Homecoming as Jason, one half of Midtown High’s hapless video news hosts, so it’s nice to see the casting directors and Knight recognizing this and letting Lendeborg run with his natural gift for comedy. Lastly, there are visual jokes threaded all throughout the movie thanks to Bumblebee. He’s not a grizzled veteran like Optimus Prime, but essentially a kid and much like an awkward teenager growing into his limbs, Bumblebee never seems to understand where to put his arms and legs and how to fit into the space he’s in. The fish-out-of-water sequence is played up big, particularly in one disastrous sequence that finds him careening from object to object (and smashing them) like a ping pong ball of disaster. Some of the verbal humor might go over young kids’ heads, but Bumblebee getting stuck inside a doorway is a sight gag that is bound to make them crack up. The thing about ’80s movies is that you can guarantee there will always be an ’80s soundtrack. When it works, it’s great. Other times, it feels like the people behind the movie simply chose the most obvious pop hits and shoehorned them into the soundtrack regardless of whether or not they fit the vibe of the movie, as if they weren’t sure it would scream “THIS IS SET IN THE ’80S! !” quite loud enough without it. But credit to music director Dario Marianelli, who did an amazing job curating a soundtrack that will have you bouncing in your seat and getting nostalgic if you lived through the ’80s, and bopping along even if you didn’t. It’s as much an homage to the music of that decade as it is an homage to the old-school Transformers franchise itself. I mean, three songs by The Smiths in one soundtrack? And not just their most obvious cuts? That’s a keeper of a soundtrack, right there. Yes, sure, there are some of the usual suspects in the soundtrack; they’re classics for a reason. But the spectrum of music in the movie is impressively ranged and thoughtfully chosen. The result is that Bumblebee has what is possibly the best-curated soundtrack in years. Summing it all up, Bumblebee puts the Transformers franchise back on solid footing, and I wouldn’t be surprised if it creates a few new fans of the franchise. It may not be getting the buzz that its competitors like Spider-Man: Into the Spider-Verse and Aquaman are getting quite yet, but it should. Definitely make a point to see this one over the holidays. Bumblebee is in theaters on December 21st. Click here to buy your tickets now!